See how this outdoor kitchen was placed in the middle of a three zone patio to serve as a gathering point. Placement is the most important consideration for an outdoor kitchen. 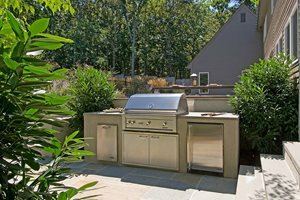 There are a handful of things to consider when deciding where in your yard to build an outdoor kitchen. Proximity - An outdoor kitchen should be located close to the home. The closer your outdoor cooking area is to your home's backyard entrance, the more convenient it will be for food preparation and transport. You don't want to be so far from your indoor kitchen that it is a hassle to go back and forth, this scenario often results in rarely using the outdoor kitchen. Views - Consider what the views will be from your outdoor kitchen. 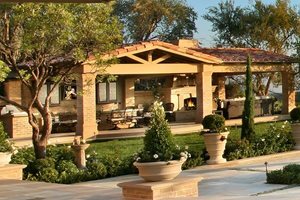 A correctly placed outdoor kitchen will take advantage of the views in the rest of your backyard landscape. 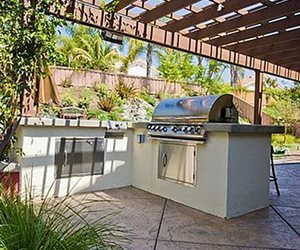 An incorrectly placed outdoor kitchen will leave guests to look at a wall or fence. If possible provide pleasant views for both guests and cook, but if not, give priority to the guests. 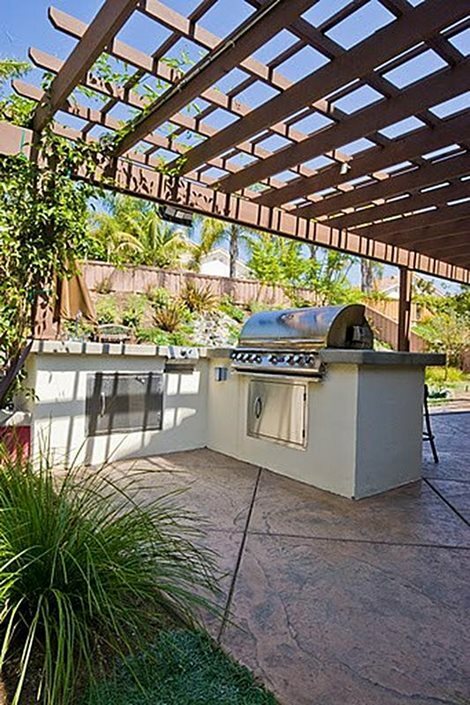 Wind - Place your outdoor kitchen so that smoke from the grill will be carried away from dining and living areas. Utilities - An outdoor kitchen must be placed in an area where gas and electricity can be accessed. 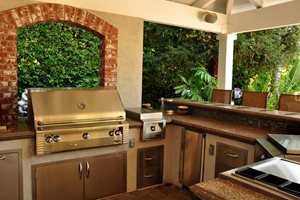 Privacy - You will enjoy your outdoor kitchen more if it has a private feel. Pick a location that will you will be able to easily shield from neighbors by plants and/or structures, such as trellises, walls or fences. Shade - To ensure that your outdoor kitchen is as comfortable as possible during the day, place it in a location that has shade. Shade for an outdoor kitchen can be provided by trees, a patio cover, pergola, or umbrella. Keep the barbecue area away from active child activity, or a sport court. You wouldn't want to be playing basketball and have the ball bounce over into a hot grill. An outdoor kitchen needs to be relatively close to the indoor kitchen, which is important for bringing food in and out.